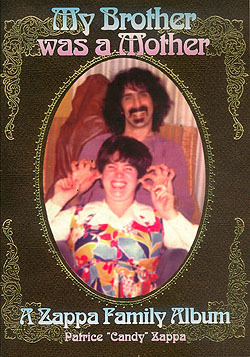 Book cover for "My Brother Was A Mother"
"In her own words, Frank Zappa's younger sister Patrice shares her memories of growing up with the iconoclastic guitarist, composer, and social observer. Always with characteristic humor, Patrice Zappa throws open a long-locked door to reveal the family history Frank long kept secret. Features more than 60 previously unpublished photographs. Patrice Zappa has performed and recorded with numerous groups including the Ed Palermo Big Band, Lennon/Tabacco/Zappa, and as part of the duo Zappa and Porter (with Nolan Porter). She lives in the San Fernando Valley. '...this is the missing piece of the puzzle that you find years later in the back of the closet under all the mothballs, mouse droppings and other stuff that sticks to the floor... there's lots of stuff here I didn't know... with this book, you are there. And we thought we knew everything about Frank Zappa! Hah!' -- from the Introduction by Greg Russo, author of Cosmik Debris: The Collected History and Improvisations of Frank Zappa." This page was last modified on 22 January 2009, at 00:41.